tenScriptAid is a programming utility that provides detail information about HS3 Devices, and generates VB.Net script statements that can be pasted into any text editor (including Visual Studio/tenScripting3). You can use tenScriptAid to display all of the CAPI commands for a device, and generate the code to paste into your script to execute each CAPI command. When you start tenScriptAid it will ask you for the IP address of your HS3 server. It then connects to HS3 (you can run tenScriptAid on a computer other than your HS3 server) and retrieves Device information. 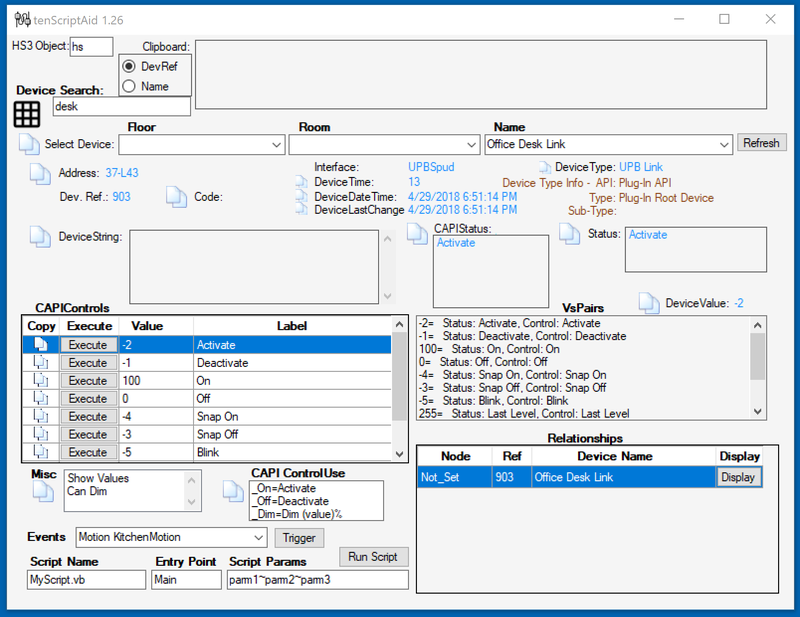 You select a Device by Location and Name, and tenScriptAid displays relevant Device information. Click on the information (for instance, the Device Address), and the VB.Net statement needed to retrieve that Device's Address will be placed onto the Windows Clipboard so you can then Paste it into your script. The sample dialog below shows that the VB.Net code to execute the CAPI Play command for the Sonos player in the Office has been placed onto the ClipBoard. Download one of the ZIP files below, extract the file tenScriptAid.exe into a separate folder. Copy the following files from your HS3 folder to the folder where you copied tenScriptAid.exe. To run, click on the tenHsEvents.exe file. tenScriptAid 1.24 3/15/2018 Restored MISC Field code generation?